The obscure Congressional budget rule known as PAYGO ("pay as you go") has burst into the news lately. A PAYGO rule means that any tax cut or spending increase passed into law needs to be offset in the same spending cycle with tax increases or spending cuts elsewhere in the budget. Incoming House Speaker Nancy Pelosi has indicated that the House of Representatives will abide by PAYGO in the next Congress, and this decision has sparked much controversy. Many Washington insiders assert forcefully that committing to PAYGO rules in the House for the next Congress is good politics. The argument is that it assuages fears of politicians who believe they must make public commitments to lower deficits to avoid being punished by voters who care deeply about this issue. If voters do indeed have strong preferences for reducing deficits, then policymakers—even those who want to use fiscal policy to reduce inequality by expanding public spending and investment—must first commit to PAYGO to convince these voters that budget measures can both reduce inequality and be fiscally "responsible." The strength of evidence supporting this political claim is debatable. What's less debatable is that PAYGO really has hindered progressive policymaking in the not-so-recent past. For example, it was commitments to adhere to PAYGO that led to the Affordable Care Act (ACA) having underpowered subsidies for purchasing insurance and, even more importantly, having a long lag in implementation; the law passed in January 2010 yet the exchanges with subsidies only were up and running by 2014. This implementation lag meant that the ACA's benefits were not as sunk into Americans' economic lives by the time a hostile Republican Congress and administration began launching attacks on it following the 2016 elections. It is a real testament to how much better the ACA made life for Americans that it has been stubbornly resistant to these attacks. But it would have been helpful to have a couple more years to have it running smoothly, but that didn't happen largely because the ACA's architects wanted to meet PAYGO rules over the 10-year budget window. Even more fundamentally, it is terrible economics to view federal budget deficits as always and everywhere bad. Making good policy in the future will require that voters be educated on this front. Why not start now? After all, our failure as a society to understand the economics of deficits and debt greatly contributed to the destructive impact of the Great Recession of 2008–09. The stakes of allowing history to repeat itself are high enough that we should take the time to quickly recap the history of how costly irrational deficit-phobia has been. In the generation before the Great Recession, D.C.-based policymakers and analysts from both political parties cultivated an unhealthy degree of fear around federal budget deficits. This excess fear of deficits led them to miss the real dangers facing the economy as the Great Recession approached. The root of the economic crisis of 2008–09 was the deregulation that allowed an enormous housing bubble to inflate to levels guaranteed to cause a deep recession when it inevitably burst. Yet most Democratic criticisms of the economic stewardship of President George W. Bush stemmed instead around his presiding over run-ups in federal budget deficits. In 2006, for example, then-Senator Barack Obama voted against raising the nation's statutory debt ceiling to signal his disapproval of excessively high deficits and debt. It was bad enough that excess concern over deficits blinded policymakers to gathering economic storms elsewhere. It was even worse that this deficit fear-mongering was happening while the federal budget deficit was extremely small and shrinking rapidly: the budget deficit in 2006 and 2007 averaged less than 1.5 percent of GDP—an amount that is absolutely sustainable forever. "But families across the country are tightening their belts and making tough decisions. The federal government should do the same. So tonight, I'm proposing specific steps to pay for the trillion dollars that it took to rescue the economy last year…Like any cash-strapped family, we will work within a budget to invest in what we need and sacrifice what we don't…"
Why am I taking you on this extended walk down the memory lane of irrational deficit-phobia? Because it had terrible consequences. The recovery from the Great Recession was the slowest in post-World War II history, and the degree of fiscal austerity canentirely explain its slowness. The figure below shows the growth in public spending per capita in the recovery following the Great Recession compared to previous recoveries. If this public spending following the Great Recession had followed the average path of the recoveries of the 1980s, 1990s, and early 2000s, a full recovery with unemployment around 4 percent would have been achieved by 2013. Now, this austerity following the Great Recession was largely driven by Republicans—both in Congress and in statehouses. But the generation of bipartisan fear-mongering about deficits surely helped Republicans hold the line on spending cuts and claim that this austerity was fiscally responsible, even as voters suffered the economic consequences. The fact that Republicans' embrace of deficit-reduction is complete hypocrisy and always takes a backseat to their desire to cut taxes for the rich is infuriating, but it doesn't change the fact that fueling excess fear about deficits (even when done in the service of good policy goals like fighting regressive tax cuts) has been terrible economics. Some people claim that the economic evils of PAYGO are overstated. After all, any sensible Congress would waive it if the economy entered a steep recession and needed expansionary fiscal policy, right? Here, it helps to look at the previous figure again—most of that spending austerity shown in the figure happened after the official recession ended, but occurred while unemployment remained extraordinarily high. The necessity for expansionary fiscal policy is not confined only to official recessions. 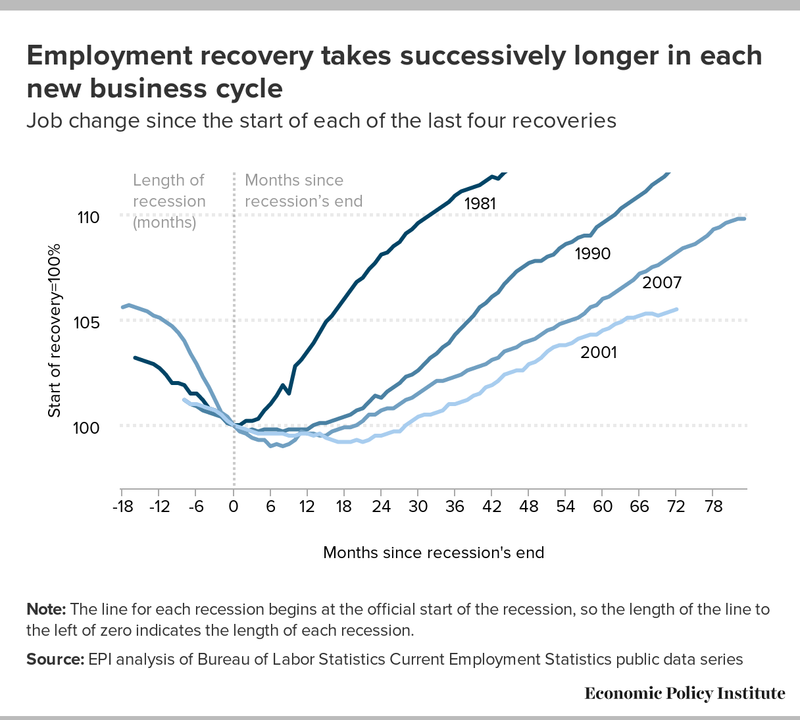 As the economy takes longer and longer to mount full recoveries after recessions, the need for fiscal policy to remain expansionary even after official recessions end is becoming clearer. Further, it is debatable whether or not some forms of spending—particularly public investments—should be subject to PAYGO at all. "Golden Rule" public budgeting argues that investments can be funded through debt. This makes eminent economic sense—the textbook reason to think that federal budget deficits can cause harm when the economy is at full employment and starved of savings is that deficits can raise interest rates and hence cause a reduction in productive business investment. But if deficits finance productive public investment, then total economy-wide investment is unchanged (as public investment just substitutes for private investment), and no economic harm is done. Does arguing against PAYGO rules mean budget deficits are never harmful or that we can spend all we want without ever having to raise revenue to finance it? No. Deficits can, in certain circumstances, potentially put a steady drag on long-run growth. And progressives need to be full-throated about the need for taxes to be higher to both penalize economic "bads" (like greenhouse gas emissions and financial speculation) and to compress the income distribution to make for more broadly shared growth. And, yes, over the long run the large majority of public spending should, on average, be financed by taxes. The current debate over PAYGO in the new Democratic majority in the House of Representatives will have very little direct effect on policymaking. The Senate is still controlled by Republicans, so little major legislation will be able to pass a divided legislature. And whatever the House decides to do with its internal rules, there remains a statutory PAYGO requirement that can only be loosened by the House and Senate together. So in the end, embracing PAYGO or not in the next House of Representatives is a purely political decision. In the short run, nodding toward conventional notions of "fiscal responsibility" and adopting PAYGO will likely win approving nods from Beltway pundits. But there's a long game that matters here, too; eventually we need to get much smarter about the economics of debt and deficits, and teach voters that the goal of fiscal policy is not always and everywhere to make deficits smaller. Our failure to do this has cost us dearly in recent decades, and now would be a good time to start.